The 2017 Valentia line takes its name from beautiful Valentia Island just off the southwest coast of Ireland, historically famous as the site of the first permanent communication link between Europe and North America with the completion of the Transatlantic telegraph cables in 1866. Like other stops on the Ring of Kerry tourist route, it’s a must-see, and I’m really hoping to spend some time there on my next Peterson pilgrimage. Don’t let the name put you off. I can see why the Calabash and Belgique got the nick-name, but the Tankard and Barrel, while small, are as quintessentially Irish as a shape can be. 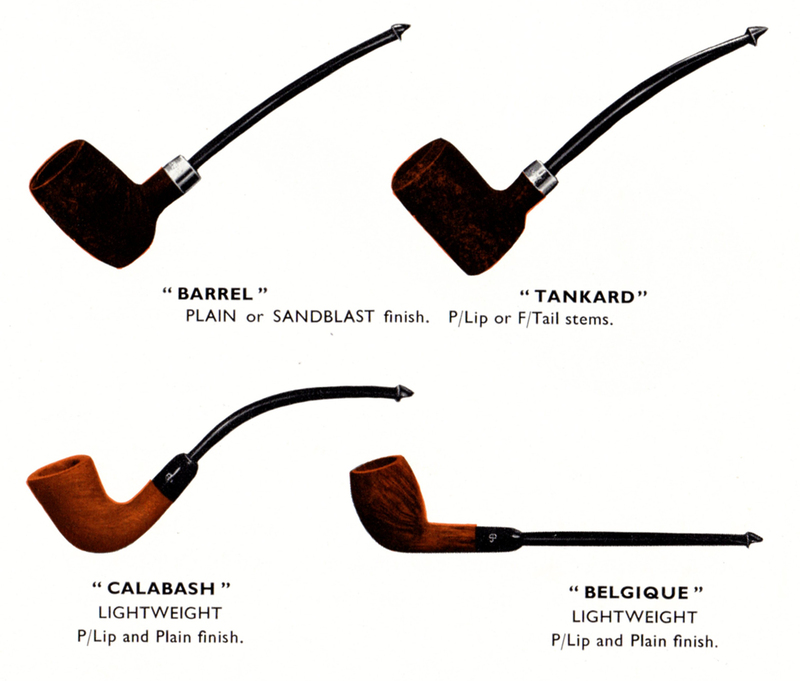 Talk about gender and pipe shapes can be useful to illustrate an aesthetic or design principle in a particular shape or line of pipes or even marque (for example, “the Peterson house style is predominantly masculine, while classic English shapes are feminine”), but is worse than worthless if attached to the gender self-identification of the pipe-smoker. This may be why 2016’s expansion of the idea began with the decidedly masculine look of the sterling army-mount Short Classics. 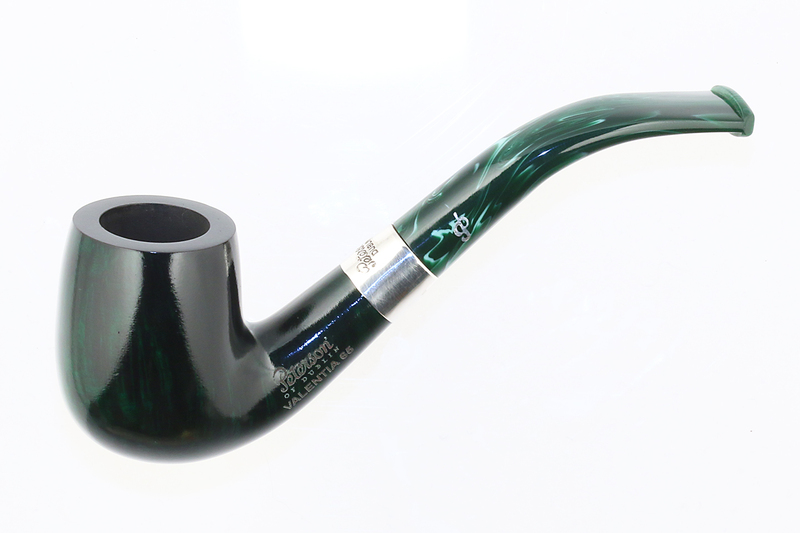 The Valentia pipes are probably the finest green-stain pipes Peterson has produced. The earliest documented example of a green Pete came back with the 200-piece Limited Edition Racing Green duo in the 1990s, and has been more or less a staple in the catalog ever since, appearing in the long-standing Racing Green line as well as several of the St. Patrick’s Day commemorative years. 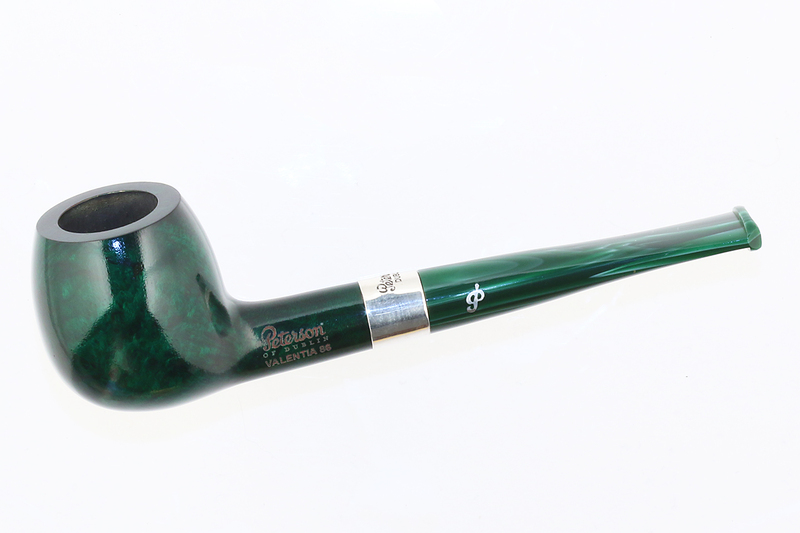 Five of the six shapes chosen for the Valentia appeared in the Short Classics line last year (of course, in army-mount dress), the shape 65 billiard being the new one. Once again, there’s quite a bit of variation in the acrylic stems, as you can see. Sometimes this can be quite dramatic. The wide flare promises a good clinching experiences, as, of course, does the extremely light weight of these pieces. I also like the slightly wider-than-usual sterling bands. The button is an interesting shape, not one that I’ve encountered before on a Pete, so I thought I’d give you a look at it as well. I’ve long been intrigued with small-bowled pipes, but my current lifestyle rarely offers me the opportunity. 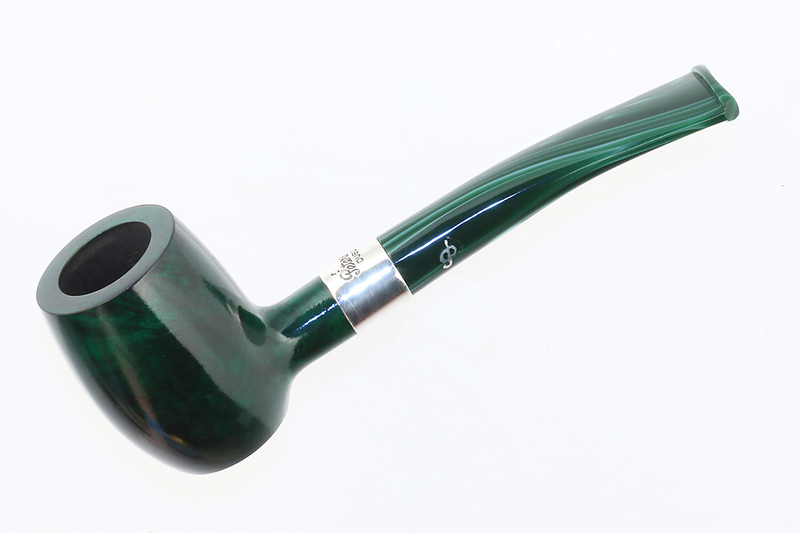 Fellow pipemen tell me they’re wonderful for short smokes or for flake tobaccos, but I’m an after-work smoker, so I’m usually looking for a bowl that will give me 2 hours or so of Pete Heaven. A next-gen System on the horizon? Nice looking pipes but if they are small I’m only interested in larger-bowled pipes. Still I’ll look if and when they are available on line. Thanks, Tom! I have several smaller-bowled Systems, but like you seem to reaach for the larger bowls. 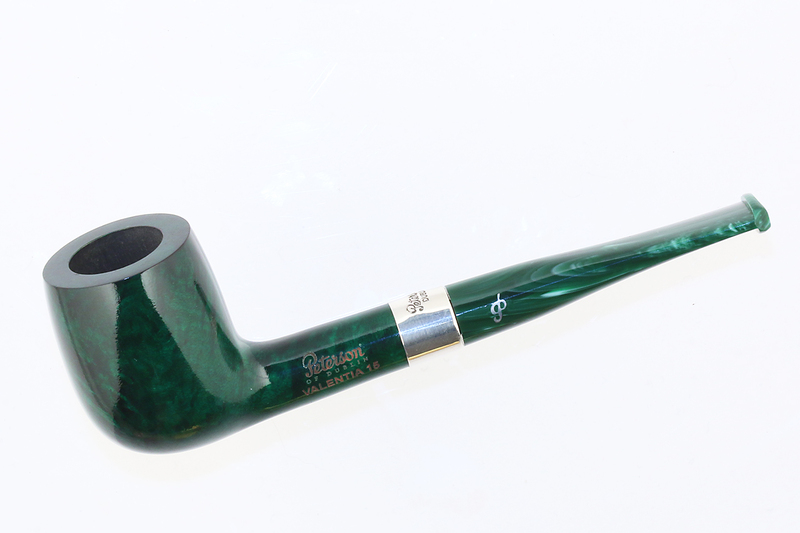 BTW, I just received my Peterson Plato from Ireland and it is a fantastic pipe. Thanks for the notification that they were available. Glad you found your Plato, and I’d love to visit St. Johns, NL! 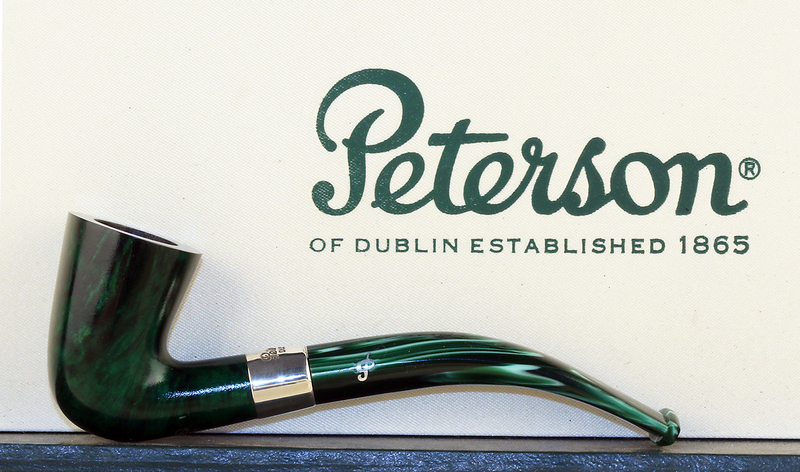 This new line of Petersons Pipe that Mark is highlighting is unique and unlike any of the Pete’s I have seen. Thanks Mark. Steve, you’re welcome, as always. The 2017 lines are stretching Peterson’s aesthetic a bit, albeit within a well-established shape chart, which makes them even more interesting. I saw a Belgique on Ebay the other day and I thought “hmm, I don’t recall that shape”. 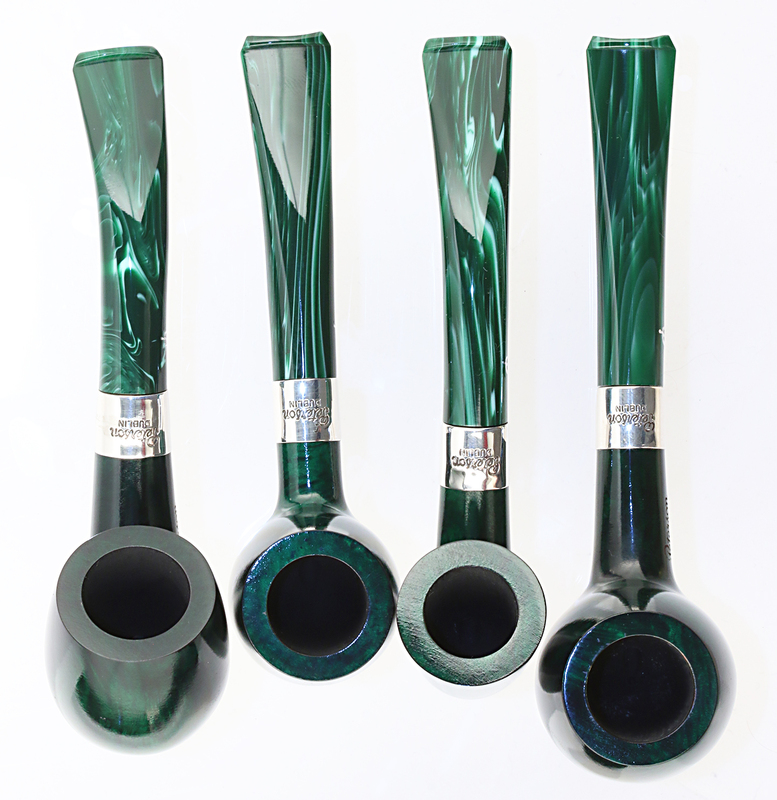 I’m not necessarily a fan of green pipes, but those have a higher level finish and are appealing. Those stems are lovely! It’s a tiny pipe, but quite striking and has a long history with Peterson. I’ve never been successful with small chambers, but obviously there’s a lot of smokers who are.